Ein Einpersonenstück für den „Mann mit den tausend Gesichtern“. Horror-Stummfilmikone Lon Chaney war Sohn taubstummer Eltern: Schon als Kind perfektioniert er also Pantomime, berühmt wurde er für seine Meisterschaft als Verkleidungskünstler mit Hang zu grotesker Erscheinung und quälenden Verrenkungen. Die 46 erhaltenen von Chaneys gut 200 Filmen hat Norbert Pfaffenbichler in A Messenger From The Shadows zum Tribut re-montiert – an die Kunst Chaneys, an die unheimliche Kraft des Horrorfilms, an den paradoxen Zauber des Kinos: Notes on Film 06. Atmosphärisches Alptraumstück über den Gefangenen eines Schattenreichs, zum ewigen Leben verdammt durch das Licht des Projektorstrahls. Das Horrorkino als Hort der Einsamkeit, durch die Bearbeitung tragikomisch zugespitzt: Lon Chaney trägt alles mit sich selbst aus – Kämpfe, Verschwörungen, das beharrliche Beobachten und die übermittelten Botschaften, all die tödlichen (Wahnsinns-)Taten, unmöglichen Liebesgeschichten und perversen Intrigen. Autoanatomie eines Genres: Absurde Reduktion und prismatische Vervielfachung – eine Person, doch die Persona mannigfach zersplittert. Der Fluss des Schnitts, kongenial untermalt mit Bernd Langs von Brechung zu Filmsymphonie tosendem Soundtrack, eint mächtige Bilder von Meisterregisseuren wie Tod Browning und Kameragenies wie James Wong Howe mit denen von vor allem durch Chaney unverwechselbar gemachte Produktionen zum bizarren Trauerspiel, aus dessen surrealer Logik es kein Entrinnen gibt: ein überwältigender (Meta-)Nachtmahr, kaleidoskopisch komponiert aus den überlieferten Resten eines gewaltigen Erbes zur Geisterbahnfahrt durch unmögliche Räume mit paradoxen Charakteren, beide ausgerechnet mittels ganz klassischer Montagestrategien neu erschaffen. Ein Totentanz, dessen böseste Pointe die unvermeidliche Wiederauferstehung ist – der definitive Phantom Ride. 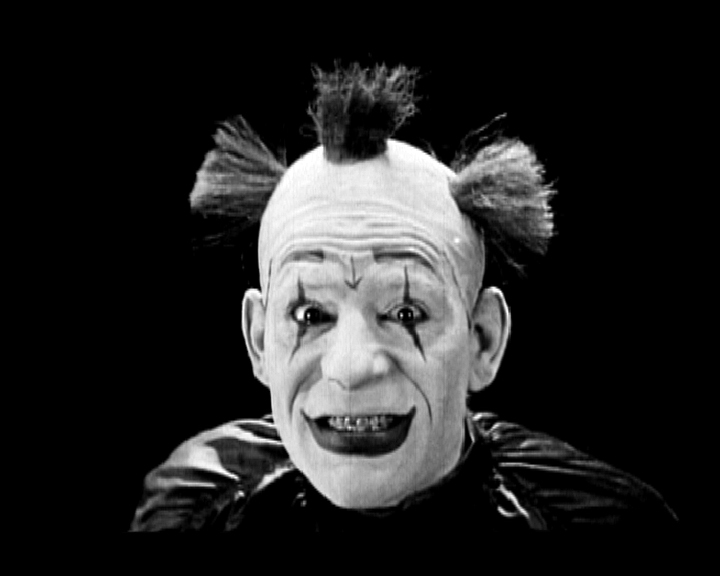 A one-person piece for the “man with a thousand faces.” Silent horror film icon Lon Chaney was the son of deaf-mute parents, and thus, already as a child, perfected pantomime. He rose to fame as a master of disguise with a penchant for grotesque appearances and torturous contortions. 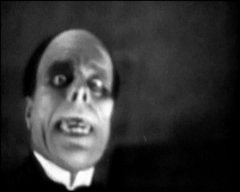 Norbert Pfaffenbichler has remounted the forty-six preserved films of the two hundred that Chaney made into a tribute in A Messenger From The Shadows. A tribute to Chaney’s art, to the uncanny power of the horror film, and to the paradoxical enchantment of cinema: Notes on Film 06. Atmospheric nightmare piece about the prisoners of a shadow realm, dammed to eternal life through the light of the projector’s beam. The horror film as a refuge of loneliness, intensified in a tragicomic way through the way it is worked out: Lon Chaney does everything alone – battles, conspiracies, the persistent observation, and the conveyed message, all of the deadly (insane-) deeds, ridiculous love stories, and perverse intrigues. Auto-anatomy of a genre: absurd reduction and prismatic multiplication – one person, but the persona multiply fragmented. The flow of the cut, congenially set to Bernd Lang’s soundtrack, thundering from refraction to film symphony, unites powerful images from master directors, such as Tod Browning, and camera geniuses, for instance, James Wong Howe, from the productions made distinct first and foremost by Chaney into a bizarre tragedy, whose surreal logic offers no escape. Emerging is an overwhelming (meta) nightmare, kaleidoscopically composing the handed-down remains of a magnificent inheritance into a ride on a ghost train through impossible spaces with paradoxical characters, both of which are newly created by, of all things, entirely classical montage techniques. 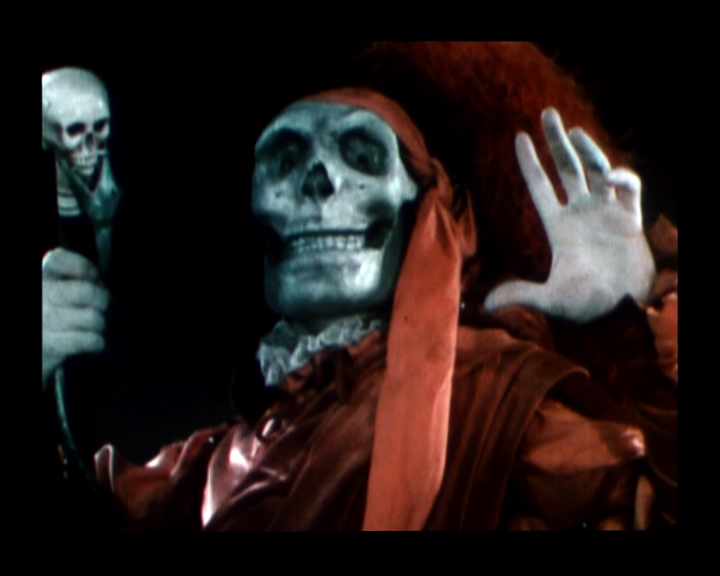 A dance of death whose most diabolic punch line is inevitable resurrection – the definitive Phantom Ride. Thanks to his myriad film roles, Lon Chaney is known as “the man of a thousand faces,” and you could say that the early horror era never beheld a figure more intriguing. Yet because of his numerous transformations, his face never became as iconic as that of, say, Boris Karloff. Accompanied by a soundtrack from Bernhard Lang, this “re-imagination of shots” taken from Chaney´s forty-six surviving films offers a beguiling excursion into the history of film. The director reveals surprising associations, while highlighting the enduring magic of works which are now more or less forgotten.